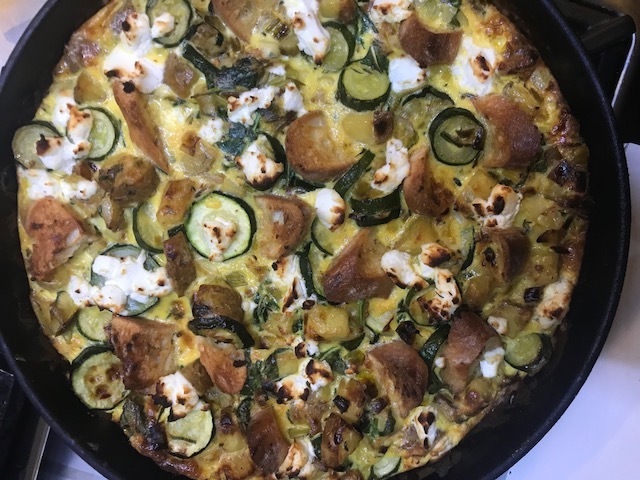 I decided that I’d make a frittata with some of the vegetables I’d brought from Arek on Saturday and including some of our goat’s cheese. It’s easiest to use the vac-packed one that’s soft and has no rind. It’s so easy to break up into small pieces using your hands. Ideally use a non-stick frying pan. Heat a little oil in it and add the potatoes and leeks. When nearly soft add the courgettes, garlic, thyme and other herbs, chilli flakes and baby spinach. Cook till nearly soft for a few minutes. Add the milk, beaten eggs and goats cheese. Stick the pieces of toasted baguette into the mixture with the top of each sticking up. Bake in a medium over (180c) until the eggs are set and you feel ready to eat it. It will take between 20-30 minutes. Or you can continue to cook it gently on the top of the stove and place in the oven for the last 5-10 minutes. Eat in warm wedges with a salad or it’s great cold for lunch over the next few days.